People generally consider sushi to be nutritious, healthy and rich in omega-3 fatty acids. However, there are also a few concerns regarding some of the ingredients in it. This article takes a detailed look at sushi and its health effects. It also provides simple tips on how to maximize the health benefits of eating sushi. Sushi is a popular dish that originates from Japan. It consists of cooked, vinegar-flavored rice rolled together with raw or cooked fish and vegetables in seaweed known as nori. It is commonly served with soy sauce, a spicy green paste called wasabi, as well as pickled ginger. Sushi first became popular in 7th-century Japan as a way to preserve fish. The cleaned fish was pressed between rice and salt and allowed to ferment for a few weeks until it was ready to eat (1). Around the middle of the 17th century, people started adding vinegar to the rice as a way to reduce the fermentation time and improve taste. The fermentation process was abandoned relatively recently in the 19th century, when fresh fish started being used instead of the fermented variety. This gave rise to an early version of the ready-to-eat sushi we’re now accustomed to (1). Bottom Line: Sushi originates from Japan and consists of a seaweed roll containing vinegar-flavored rice, raw fish and vegetables. Hosomaki: A thin seaweed roll containing rice and just one type of filling — for example, an avocado or cucumber roll (photos). Futomaki: A thicker specialty roll that usually contains a combination of rice and several types of fillings (photos). Uramaki: A specialty roll containing several ingredients, but with the seaweed on the inside and rice on the outside (photos). Temaki: A cone-shaped hand roll that holds fillings inside (photos). Nigiri: Mounds of rice covered by thin slices of raw fish (photos). Sashimi is thin slices of raw fish. It technically isn’t sushi, but is often served with it. Bottom Line: Sushi comes in several different types. The five most popular are hosomaki, futomaki, uramaki, temaki and nigiri. Sushi is often regarded as a health food, mainly because it contains the following nutrient-rich ingredients. Fish is a good source of protein, iodine as well as several vitamins and minerals. In addition, it’s one of the few foods that naturally contain vitamin D (2). What’s more, fish contains omega-3 fats needed for your brain and body to function optimally. They help fight medical conditions like heart disease and stroke (3, 4, 5). Fish consumption is also linked to a lower risk of developing certain autoimmune diseases, depression and loss of memory and vision in old age (6, 7, 8, 9, 10). Wasabi paste is often served alongside sushi. It is very spicy, so it is only eaten in small amounts. It is made from the grated stem of the Eutrema japonicum plant, which is part of the same family as cabbage, horseradish and mustard. Wasabi is rich in beta-carotenes, glucosinolates and isothiocyanates. Research shows that these compounds may have anti-bacterial, anti-inflammatory and anti-cancer properties (11, 12, 13, 14). However, due to the wasabi plant’s scarcity, many restaurants use an imitation paste made from a combination of horseradish, mustard powder and green dye, which is unlikely to have the same nutritional properties. Nori is a type of seaweed used to roll sushi. It contains many nutrients, including calcium, magnesium, phosphorus, iron, sodium, iodine, thiamine as well as vitamins A, C and E (15). What’s more, 44% of nori’s dry weight is protein, which is comparable to high-protein plant foods such as soybeans (16, 17). However, one roll of sushi contains very little seaweed, which makes it unlikely to contribute to much of your daily nutrient needs. Studies show that nori may also contain compounds that have the ability to fight viruses, inflammation and perhaps even cancer (18). Some claim that nori also has the ability to clear heavy metals from the human body. However, research shows that this property is more likely attributed to brown types of seaweed such as those found in wakame salad (19). Sweet pickled ginger, also known as gari, is often used to cleanse the palate between different pieces of sushi. Ginger is a good source of potassium, magnesium, copper and manganese (20). In addition, it may have certain properties that help protect against bacteria, viruses and perhaps even cancer (21, 22). Studies further show that ginger may improve memory and help reduce nausea, muscle pain, arthritic pain, menstrual pain and even LDL cholesterol levels (23, 24, 25, 26, 27, 28). Bottom Line: Sushi contains various healthy and nutrient-rich ingredients, such as fish, wasabi, seaweed and pickled ginger. The main component of sushi is white rice, which has been refined and stripped of almost all fiber, vitamins and minerals. Studies show that refined carbs may cause inflammation and potentially increase the risk of type 2 diabetes and heart disease (29, 30, 31). What’s more, sushi rice is often prepared with sugar. The added sugar and low fiber content means that the carbs are broken down quickly in your digestive system. This can lead to a spike in blood sugar and insulin levels, which has been shown to contribute to overeating in many studies (32, 33). However, studies also show that the rice vinegar that is added may help lower blood sugar, blood pressure and blood fats (34). Asking for your sushi to be prepared with brown rice instead of white rice can increase its fiber content, nutritional value and reduce the blood sugar spike. You can also request that your rolls contain a little less rice and more vegetables to further increase the nutrient content and make them feel more filling. Bottom Line: Sushi contains a large amount of refined carbs. This can make you more likely to overeat and may increase your risk of inflammation, type 2 diabetes and heart disease. Sushi is often thought of as a weight loss friendly meal, but it may not be as beneficial as you think. That’s because many types of sushi are made with high-fat sauces and fried tempura batter, which significantly increases the amount of calories you get. What’s more, a single piece of sushi generally contains very little fish or vegetables. This makes it a low-protein, low-fiber meal and therefore not very effective at reducing hunger and appetite (35, 36). This perhaps also explains why eating a portion of sushi will leave most people still feeling hungry. To make your next sushi meal more filling, try accompanying it with a miso soup, a side of edamame beans, a portion of sashimi or a wakame salad. Bottom Line: Sushi often contains high-fat sauces and toppings, but relatively little vegetables or fish. This can easily turn it into a high-calorie meal that’s less likely to make you feel full. A sushi meal generally contains a large amount of salt. First, the rice used to make it is often cooked with some salt. In addition, the smoked fish and pickled veggies used to make certain types of sushi also contain salt. Finally, it’s usually served with soy sauce, which is very high in salt. Too much salt in your diet may increase your risk of stomach cancer. It may also promote high blood pressure in people who are sensitive to sodium (37, 38, 39). If you want to reduce your salt intake, then you should minimize or avoid the soy sauce, as well as sushi prepared with smoked fish, such as mackerel or salmon. Although miso soup may help prevent you from overeating, it contains a lot of salt. If you’re watching your salt intake, you may want to avoid that as well. Bottom Line: Sushi can contain a large amount of salt, which may increase the risk of stomach cancer and promote high blood pressure in some people. Eating sushi made with raw fish may put you at risk of infection with various bacteria and parasites (40, 41, 42, 43). Some of the species most often found include Salmonella and various Vibrio bacteria as well as the Anisakis and Diphyllobothrium parasites (44, 45, 46, 47). It’s important to note that the US Food and Drug Administration (FDA) does not currently regulate the use of the “sushi grade fish” label. Because of that, this label does not guarantee that the sushi you are eating is safe. The only current regulation is that certain fish should be frozen to kill any parasites before being served raw. 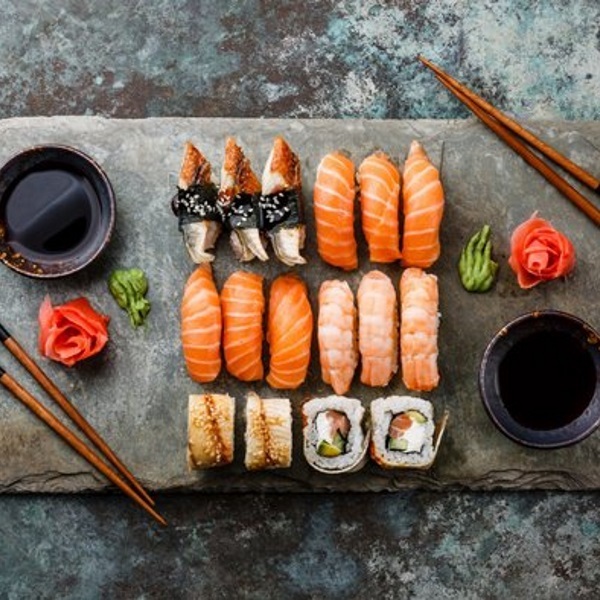 One recent study examined the raw fish used in 23 Portuguese restaurants and found that 64% of the samples were contaminated with harmful microorganisms (48). However, proper food processing and handling procedures can reduce the risk of contamination (49, 50). If you wish to reduce your risk of contamination, aim to eat sushi at reputable restaurants. These are more likely to follow proper food safety practices. Opting for vegetarian rolls or ones made with cooked fish can also be beneficial. There are some people that may need to avoid sushi made with raw fish. This includes pregnant women, young children, older adults and those with weakened immune systems. Bottom Line: Improper food processing and handling practices combined with the use of raw fish and seafood increases the risk of contamination with various bacteria and parasites. Fish can also contain certain toxins due to pollution of the sea. The best known toxin is mercury. Predatory fish tend to have the highest levels of mercury. These include tuna, swordfish, mackerel, marlin and shark. Seafood species that are low in mercury include salmon, eel, sea urchin, trout, crab and octopus (51). Other types of toxins found in fish can lead to ciguatera or scombroid poisoning (52). Sea bass, grouper and red snapper are the most likely to lead to ciguatera poisoning, whereas scombroid poisoning is most likely to result from consumption of tuna, mackerel and mahi mahi (52). You can reduce your risk by simply avoiding the types of fish most likely to be contaminated. Bottom Line: Certain types of fish are more likely to be contaminated with toxins. This includes mercury and toxins that can lead to ciguatera or scombroid poisoning. Increase your nutrient intake. Choose sushi rolls made with brown rice over those made with white rice. Favor cone-shaped hand rolls. Look for temaki on the menu. These rolls contain less rice than more traditional rolls. Increase the protein and fiber content of your meal. Accompany your sushi with a portion of edamame, a wakame salad, a miso soup or sashimi. Avoid rolls made with cream cheese, sauces or tempura. To create crunchiness without these unhealthy ingredients, ask for extra vegetables. Cut down on soy sauce. If you are salt-sensitive, avoid soy sauce or only lightly brush the top of your sushi with it. Avoid certain types of fish. Do not order rolls made with salty smoked fish or fish species at high risk of toxin contamination. Order sushi from reputable restaurants. They’re more likely to follow proper food safety practices. Bottom Line: There are various ways to increase the health benefits of your sushi while reducing the risk of negative effects. Bottom Line: Is Sushi Healthy or Unhealthy? Sushi is rich in several vitamins, minerals and health-promoting compounds. However, not all types are equally healthy or nutritious. Some of them are high in refined carbs and other ingredients that can be problematic. That being said, if you follow the tips above, then eating sushi can definitely be healthy. Will Men’s Physique Ultimately Overtake Bodybuilding?